Now the Exam for SSC CGL Tier 1 Exam 2018 has been postponed. The exam date not yet announced for SSC Combined Graduate Level Tier 1 Exam 2018. The Staff Selection Commission (SSC) is expected to release the SSC CGL Tier 1 Exam Admit Card 2018 soon. Friends, earlier the SSC CGL Tier 1 Exam 12018 was expected to start from 25 July 2018 and go on till 20 Aug. 208. The new examination date has not updated in SSC Calendar. Nearly about 15 Lakh candidates appear this SSC CGL Tier 1 Exam 12018 each year. 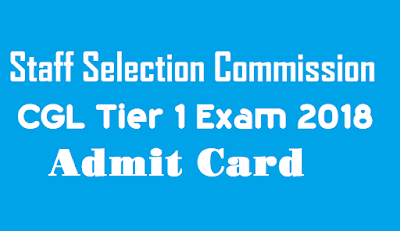 It is expected that the SSC CGL Tier 1 Exam 12018 Admit card will be uploaded any time at official website www.ssc.nic.in of www.ssconline .nic.in. Candidates should regularly visit the official website for new updates. Every year the SSC holds this Tier 1 exam for the post of “Group B” and “Group C” in the department, ministries in the India Government. 1. First, go to the official website www.ssc.nic.in. 2. Click on the appropriate link on the official page. 3. Enter all the information which was required correctly. 5. Admit card will be displayed on another window. 6. Save and Print the admit card for future need. I hope you like this post very much and thanks for reading. Please visit regularly for more new updates. Share this post with your Friends or relatives. Join me also in Social Media.